Most of the cottagers at least once faced with the yellowing cucumber leaves, and in some cases spots on the vines become the scourge of gardeners. Causes of damage to beds can be many – improper care for the vegetable culture, various diseases, the invasion of pests. Whatever caused the appearance of yellow spots on the leaves of cucumbers, vacationers not to let things slide, otherwise it may die a significant part of the crop. Often the reason that the yellow leaves of the cucumbers, it becomes the rotting roots of the vines. Signs of this crack at the bottom of the stalk and premature decay. The reason for the trouble may be incorrect watering: in small doses, but too frequent. The water remains on the surface, the roots begin to move the top and become vulnerable. They can damage weeding, hilling, ultraviolet radiation. Abundant, but very rare watering is also not useful vegetable crop, as the roots podgniet due to excess water. Optimal water cucumbers 2 times a week (about 25 litres per plant). Consider already saturated the ground with moisture to further keep the garden. Root decay can occur if water for irrigation was too cold, and unexpected frosts. To reduce the risk of root rot, the seedlings should not be planted in the former garden with melons. Also, it is not too high hill of cucumber stems. If the roots have begun to rot and the leaves turned yellow, diseased plants must be uprooted and destroyed, the rest are treated with copper oxychloride (40 g per ten-litre bucket of water). The temperature of the solution must be at room temperature. Always carefully vypilivaya all the weeds on vegetable beds, because they winter many pests of vegetable crops. Disease cucumber bacteriosis is a common problem. The disease is favoured by high humidity of earth and air, and is the indispensable companions with regular watering. Bacteria may infect the seedlings, cotyledons, fruits that rot before ripening. Spots between the leaf veins in this disease, angular, brown or dark green. 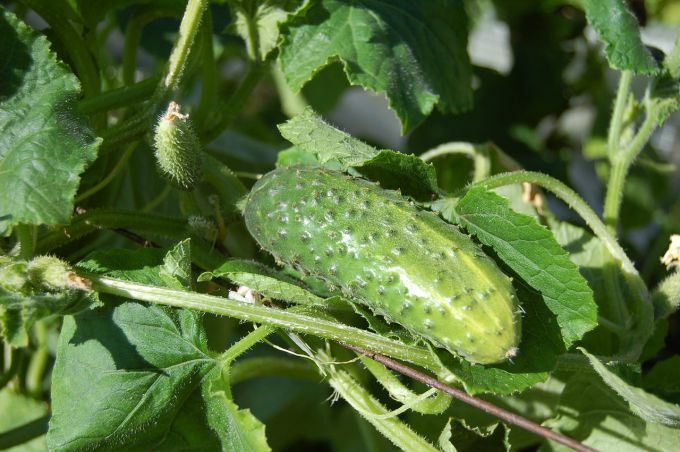 In the rain and after the condensation, you can easily put your cucumbers the diagnosis of "bacteriosis": spots on the leaves become oily, appear a drop of turbid mucus. Bacteriosis of cucumbers treated by bactericidal drugs, such as "Previcur" (20 ml per ten-litre bucket of water), "Quadris 250 SC" (6 ml per 5 liters of water) or "Atfal" (20 g per bucket). In the fall, after harvest, deeply perepihnutsja the garden – even if the holes remained sick leaves in winter, the bacteria will die in the ground. It is important to remain competent rotation to completely clean the ground. Instead of cucumbers it is best to plant oats, peas or beans and return the favorite vegetables on a former place not earlier than 4 years. The leaves of cucumbers can turn yellow if the culture was infested by insects. Mostly vines olubowale bocheva aphids, loves damp and warm weather. As a rule, when it appears in the garden don't just turn yellow and curl the leaves, but also damaged the ovary and the inflorescence. Good results in combating this pest gives vegetable processing plants with a solution of soap (300 g per ten-litre bucket of soft water). If the tool does not work, you will have to spray vines with insecticide medications, such as "Malathion", "Trichloral", "Fosfamid". Proceed according to the instructions on the package. If you had to spray the vegetable garden with chemicals, all the cucumbers that were on the vine during the treatment, you will have to throw away. Following the ensuing fruit will be eaten. There are many garden pests that cause damage to the leaves of cucumbers behind the growth of the vines and reduced yields. Among the most common - worm-like nematode, spider mites, stem borer. At the first sign of insects attack a plant can try to save by treating with chemicals. But if the vine suddenly began to quickly fade, dig and burn not only diseased plants, but the soil from the hole. Even if you do not find out the reasons for yellowing cucumber leaves, stick to a simple rule: the infection should be removed timely so that the disease does not spread to the whole bed. Cucumbers - the culture that is grown in almost all gardeners. The plant is not very fastidious: it requires only the watering and feeding, treatment of stems and leaves of antiparasitic and antifungal drugs as appropriate. In most cases, white spots on cucumbers appear because of destruction of plant fungal disease called "powdery mildew". The leaves look like they're dusted with flour. The disease spreads quickly and if we do not take any measures, the leaves dry up one after the other, which leads to the death of the whole plant. "Powdery mildew" affects mainly cucumbers, in the greenhouse. Because in the greenhouse the most favorable conditions for the emergence of the fungus: high humidity. If the temperature in the greenhouse never rises above 20 degrees (quite often occurs in early and late summer), the fungi appear in 99% of cases. To protect cucumbers from powdery mildew, you need in the daytime be sure to ventilate the greenhouse, the seedlings to be watered moderately, and at night to close the building, the temperature does not fall too low. If the disease has already hit some cucumber leaves, spray them either with a decoction of horsetail, or infusion of mullein. 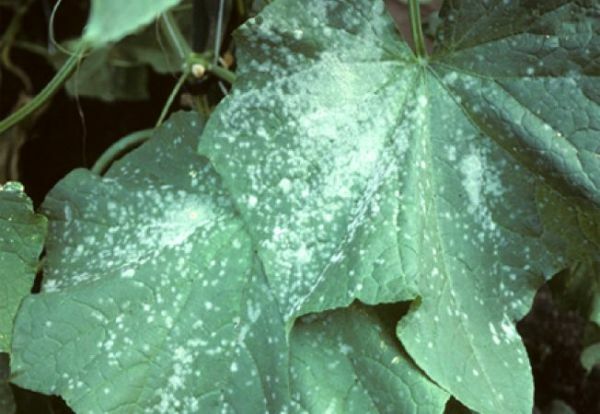 In the case of "powdery mildew" was struck by a leaf, for spraying use special chemicals. It is worth noting that leaves can turn white and other reasons. For example, if the sheets of white mucus, the edges of the leaves dry, then the plants struck by white rot. Covered with light spots the leaves of cucumbers can, and due to the lack of nutrients. In this case, to cope with them will help timely feeding. The lack of fertilizer application may significantly reduce the yield, if not to deprive him. To protect the landing from the above diseases, before planting the seedlings replace the soil in the greenhouse, sterilize the earth, Bessarabia the greenhouse, fertilize plants, timely watering, as necessary to ventilate the greenhouse.